Food science is awesome. I have never whipped eggs until they turned into an almost marshmallow fluff consistency. It’s truly amazing what food can turn into after you manipulate it enough. And that is why I call these macaringues. They are like a cross between a macaroon and meringue. They set out to be macaroons but when they came out of the oven they were not the towering clump of coconut I usually see in the stores. 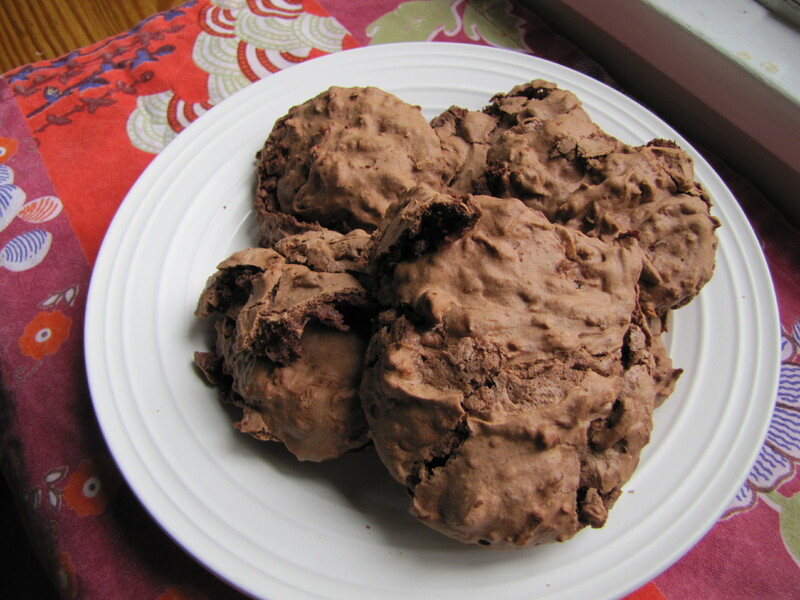 Instead they were airy, chewy and chocolatey goodness. Maybe that’s not actually like a meringue but someone said macaringue and I liked it. It’s not like I’m disappointed because they’re really good and make excellent topping on vanilla ice cream. Enjoy these delightful cookies and Happy Passover!! 1. Melt chocolate in glass dish in the microwave for one minute. Stir and heat in 30 second intervals until chocolate has melted. Set aside. 2. Beat egg whites with electric mixer on medium-high until foamy, about 30 seconds. Add salt until soft peaks form. Add sugar one tablespoon at a time, beating for 10 seconds after each addition, until stiff peaks form, about 3 minutes total. Beat in lemon juice and vanilla. 5. Drop spoonfuls of batter onto the parchment paper. Bake for 10-13 minutes, until macaroons puff up. Don’t let edges brown or they’ll be over cooked. Let cool on wire rack and repeat with the rest of the macaroons and serve. perfect timing! thanks and chag sameach! looks beautiful, and sounds delicious!! Happy Passover! !